Ever wondered exactly what estate agents actually do to earn the big fee they take when they sell a property? Read on to discover how they help you market your home, secure a sale and make sure you make it through to completion. An estate agent will be able to give you an expert view on how much your house is worth, setting it at the right price to market. They will draw upon their knowledge of the local property market as well sold prices of other local homes like yours from the Land Registry to give you an accurate picture of what homes like yours are selling for and why you might pitch for more or less. It is important to do your research first so you have a figure in your mind. To do this, start by getting a free online instant valuation and by checking Land Registry figures. Then get three different estate agent valuations as some firms may use the strategy of over-estimating the price of your home to try to secure you as a client. A good agent will have experience of what features buyers in the area are looking for and be able to tell you whether it is worth making changes to improve the appeal of your home to achieve a higher price. They should be able to impress you with their local knowledge and expertise in selling houses like yours. If you are considering using an online estate agent, it is still a good idea to get three valuations from high street firms because online agents tend to lack knowledge of the local market and will therefore be heavily reliant on online data to carry out their valuations. Your estate agent should arrange for your property to be professionally photographed, get an accurate floor plan drawn up and write a detailed, accurate, attractive description of your home to be used in the brochure, its shop window and on the big property portals. You shouldn’t have to pay any extra for the photography and these other basics as they should all be included in the % fee the estate agent charges for marketing and selling your home. Make sure that the pictures are up to scratch as they are crucial to attract plenty of viewings. If they are not up to scratch, request that new ones are taken. And cast your eye over the property details. These need to be correct to avoid problems further down the line. Your estate agent will be able to tell you how the big property websites work – such as Rightmove and Zoopla – and have accounts with them so that your property will be advertised on these sites. Before you start marketing your home it is a legal requirement to have an Energy Performance Certificate (EPC) which tells potential buyers how information about a property’s energy use and typical energy costs. Your home will be given an energy efficiency rating from A (most efficient) to G (least efficient) and the EPC is valid for 10 years. Your estate agent can organise this for you for a fee. Get a quote from your estate agent but shop around. You can find an assessor and get a quote here. If you have purchased your home in the last 10 years you may already have a certificate which is still valid. If your property doesn’t sell as quickly as you had hoped – or the estate agent had promised – speak to your estate agent and ask why that’s the case. You are paying them to market your home and secure a sale so ask them why your house isn’t selling. Stay in regular touch with them, asking for feedback from viewings and what they are doing to actively market your home. Your estate agent will arrange viewings of your home and guide potential buyers around the property answering any questions or queries people have. Your agent should also make sure your property is secure when they leave after a viewing. Once your property is on the books with an estate agent they may have a list of potential buyers who have expressed an interest in a property like yours that they will call to market your home to. Estate agents may also arrange an open house for your property where numerous buyers visit during a specific time period. The advantage of using an estate agent to conduct viewings on your behalf is they are seen as a more neutral party by potential buyers who may ask them questions that they would be embarrassed to ask the owner themselves. It also takes the hassle away of you having to show people round your home. If you conduct your viewings yourself, you need to ask yourself how the estate agent is earning their commission fee. In this instance, you might be better off selling with an online estate agent. You usually pay a fixed fee (which works out cheaper than the percentage commission fee high street agents charge) but is payable upfront i.e. whether you sell your property or not. The default option with online estate agents is that you show potential buyers around the property yourself. Hybrid estate agents like PurpleBricks are growing in popularity as they also offer a local property expert to conduct viewings for you. Other online estate agents are increasingly following suit by offering add-on options to conduct viewings. But these usually come at an additional charge – so speak to the agent to understand how many viewings are included, what the additional price is, who will conduct the viewings and how it will work in practice. A key part of an estate agent’s job is to manage negotiations and act as a go-between for any potential buyers and the owner of a property. Offers should be made to the estate agent who will pass them on to the owner and, similarly, relay the seller’s response to any offer submitted. During this period the estate agent can be helpful to the buyer but ultimately they should always put the seller, their client, first and aim primarily to get them the best price for the property. If you are thinking about making an offer on a property you can ask the estate agent for more information on the position of the owners – have they found their dream home and are they in need of a quick sale, or do they need someone who is prepared to wait while they hunt for somewhere to live? Buyers can also usually get a feel for what level of offer might be considered acceptable by the vendor via the estate agent. Under the Property Ombudsman Code of Practice, estate agents must take reasonable steps to find out from the buyer the source and availability of their funds for buying the property and pass this information to the seller. This will cover whether the buyer needs to sell a property, requires a mortgage, claims to be a cash buyer or any combination of these. Usually they will ask the buyer to show an agreement in principle from a mortgage lender to prove that they are in a position to afford the property. Find out more with our guide to proof of funds. Under this Code estate agents are also legally obliged to put all offers through to their client, you the seller, even if the buyer hasn’t been financially qualified at this stage. When you accept an offer, it is then the estate agents job to regularly monitor the buyer’s progress in achieving the funds required and keep you informed. All of this information will help your estate agent advise you on the position of the buyer and how serious or good an offer is. They should be able to help you decide whether or not to accept an offer – but ultimately that decision is up to you. Once you’ve accepted an offer, or had an offer accepted, then the estate agent should issue a Memorandum of Sale to the vendor, buyer and their solicitors all the information they need on each other and each party’s solicitors. 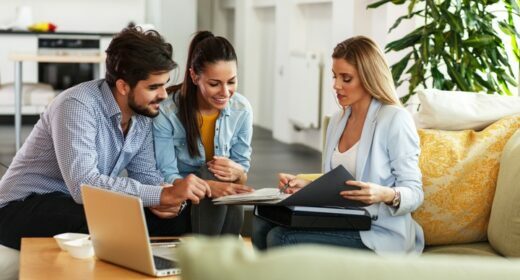 Many people think an estate agent’s job ends once an offer has been accepted, but this is where a good estate agent will really come into their own by helping make sure that the offer moves forward, unblocking issues up and down the chain and working to the critical points of exchange of contracts and a date for completion. During this period your estate agent can act as your adviser and agony aunt as you negotiate the peaks and troughs of the sales process. You can lean on them as much or as little as you want. When choosing an estate agent don’t just go with whoever says they can sell your home for the highest price, or the agent with the lowest fee. Check the facts on our estateagent4me tool which tells you which local agent sells homes like yours for the asking price and fastest. For more detailed advice read our full guide on how to choose an estate agent. All this work comes at a cost, but don’t pay over the odds to your estate agent. Read our guide to how much you should pay an estate agent. If all goes wrong and you fall out with the person or company you have employed read our guide on how to complain about your estate agent. Read the small print of their contracts carefully. You’re looking for hidden charges and dodgy practices such as long tie-ins. Take a look out our guide on Estate Agent Contracts – what to watch for. The HomeOwners Alliance provides members with guidance on their agreements with estate agents. If you would like us to look over the contract before you sign, find out more about becoming a member of the HomeOwners Alliance. And finally, don’t feel pressured into using the estate agents partner firms such as their own mortgage brokers or conveyancers that they have a commercial relationship with. Only use an in-house broker if it has a large panel of lenders or ideally considers the whole of the market. By all means get quotes from the services recommended by the estate agent – from mortgages to conveyancing to removals – but then shop around to make sure you’re getting the best deal.